It is too hot to think. took Bruiser for a spritely walk. bought Sprite for singing son, because he had a sick stomach. drove to Park City to work on a syllabus with colleague. went to lunch with colleague and talked about television and movies. And kvetched about work. went to the Gap outlet store where I picked up a skirt and walked around with it, spritzed myself with Grass eau de cologne which I have a nostalgic fondness for even though these days it smells like the chemical formula for "grass." Put the skirt back. Bought nothing. drove down the mountain to a meeting. kvetched about work with another colleague, after the meeting. arrived at the same time as the historian. Whined about the heat. Turned on the swamp cooler. Poured myself a tall glass of ice water. Which brings us to now. We are preparing for an evening of crosswords and television and some dinner at some point, with possible ancillary heat-related whining (on my part--the historian does not whine. Seriously: never.). Also, many iced beverages. My husband reports to me that there's supposed to be a cold front, which he heard about on the radio while driving home. What does the term "cold front" mean, with respect to how hot it is now? And the fact that it's August? I just want some assurance that the Doppler Radar, or whatever, is correct about this, and that I will recognize it when it happens. Tell me, Weather Robot, what will the weather be like? 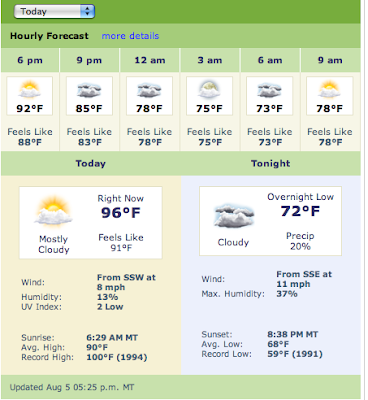 Please do note that, while the temperature is 96 degrees, it feels like a mere 91 degrees! I'm sure that, if you happen to be currently taking a cool shower, while sipping a Slurpee and thinking of Antarctica, you will concur. 77 degrees, with scattered T-storms, is cool enough that it doesn't have to feel like anything more or less than its own damn self. Cool thought - a prognosticating robot for life in general - not just how will the weather be Friday. Does it makes the heat less hot to hear that 77 is on its way? I think maybe so. I'm heading your way. Keep it cool!!! AND I am laughing because this post just makes me so happy. Thanks, HTMS! I've been doing nothing as my brain refuses to think or retain any information. Well, I went to a friend's for a bit so the kids could get out and play while I didn't think. So glad I read this tonight. Made me laugh which I really, really needed. I am dissappointed that while the weather robot can tell you what the temperature will be in the future, it cannot tell you what it will feel like. Really, shouldn't we have this technology already? 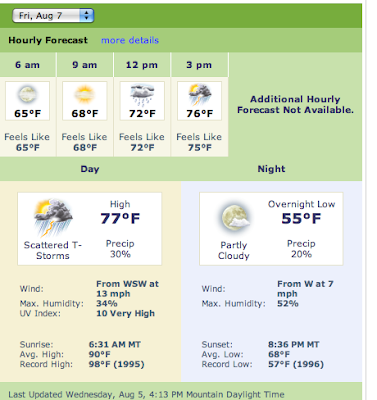 And I was just going to look up the weather--not to fear Hightouch is here. Hey, it takes thought power to kvetch, I'm quite sure. Also, you're "walking with a skirt" theory has saved me hundreds of dollars. i LOVE cold fronts. but i prefer them without choking smoke.